June 22, 2010 - Raleigh, NC - All Electric Scooters, an online retailer of mobility and recreational scooters and scooter accessories, announced today the release of the Pride Pursuit Personal Mobility Vehicle. Available for a limited time and sold on a first-come, first-served basis, the Pride Pursuit replaces the Pride Hurricane as their flagship heavy-duty mobility scooter, sporting a weight capacity of 400 pounds. The Pursuit is equipped with 13-inch flat-free solid tires, regenerative electromechanical brakes, and front and rear suspension for maximum stability. With a four-inch ground clearance, the Pursuit is specifically designed to handle well on rough terrain. 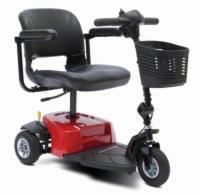 This PMV can travel at speeds up to 8 miles per hour and has a 14-mile range on a single battery charge. It disassembles easily using Pride's feather-touch technology and features accessible tie-down points for hauling the scooter on a trailer. These features combine to create a versatile all-terrain mobility device that is easy to haul along on vacations and road trips. Pride intends to manufacture and market the Pursuit as a limited release, so only a small number will be made. All Electric Scooters expects an influx of customer inquiries about the new personal mobility vehicle, which is available in Candy Apple Red and Viper Blue body colors. "We make every effort to keep our salespersons up to date on new products as they are released, so we've made sure that our people are familiar with the specifications of the unit going forward," said Tim Ziehwein, Vice President of Sales for All Electric Scooters. "PMVs are especially favored by users who live in rural areas and disabled individuals who travel considerable distances from home for lengthy periods of time during their day-to-day life, and we think the Pursuit will be very well received by those people. We're very glad to be able to offer this product to our customers, and we'd like to put as many folks who want a Pursuit PMV into the captain's seat of one as we can, while it's still available." All Electric Scooters carries a large selection of electric scooters, ramps, lifts and trailers in addition to the Pride Pursuit PMV, from industry leaders such as Pride Mobility, Golden Technologies, Shoprider, AmeriGlide, Prairie View, and Burr. 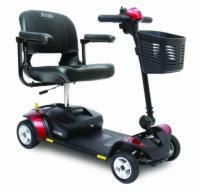 To browse their entire selection of mobility products, please visit AllElectricScooters.com.